... I spent a few hours altering a white bra from Wal-mart today. Christy Hillard, owner of Pensacola's Scraphappy, asked me to submit a contest entry and suggested I make a Kits2Remember one. So, I obliged. 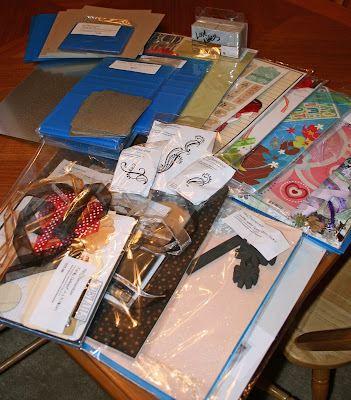 Some of the product I used: K2R acrylic flowers; Key Lime Gimmer Mist from Tattered Angels; Heidi Swap patterned tape, bling and hibiscus foam stamp; flowers and bling brads from Imaginisce and LOTS of ribbon... Is your local scrapbook store participating in Scrap Pink this year? Consider creating an altered bra to auction off for the Susan G. Komen foundation. 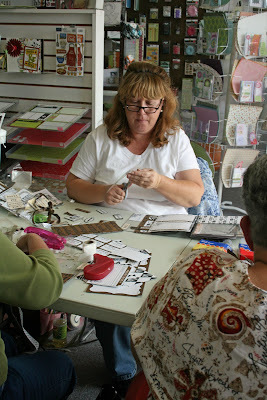 Find out more about Scrap Pink here and Scraphappy's Sept. 25-27 ScrapPink crop here. Congrats to the K2R Kontest Winners! "Supply List: Creative Imaginations 2008 chipboard album, Acrylic, Little Yellow Bicycle "Zach's Life Collection" paper and embellishments, danelle johnson Swatch Book Impress-ons, Robin's Nest dew drops." 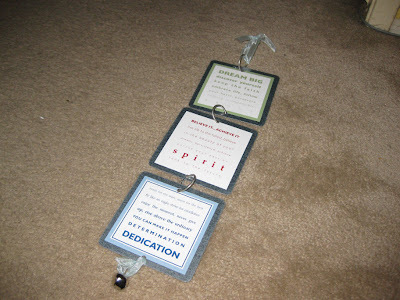 "I used three of the 4 x 4 metal panels, 3 o-rings (from 7Gypsies), 1 jingle bell (from Kits2Remember) in the goodie basket by the cash register at the Expo's, Ribbon (from a Kits2Remember kit - sorry, don't remember which kit), 3 Me and My Big Idea Stickers (from Kits2Remember) Dream Big, Spirit, Dedication.I peeled the back of the stickers off, placed them on the metal, used the Crop-o-Dile to punch the holes, snapped in the o-rings, tied on the jingle bell and ribbon hanger at the top, and voila - done - really, about 5 minutes to make - I love it!" 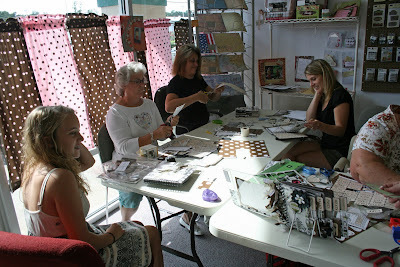 "Supplies I used were Kits2Remember 8x8 panels, the Love, Elsie travel line from KI Memories. I've been hoarding the paper, ribbon and epoxy stickers for a long time to use for a special occasion. 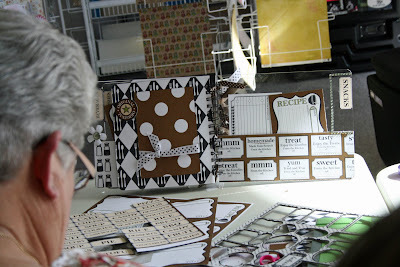 I also used Heidi Swapp plastic letters for the SF and journaling spots. And a Hambly transparency with stitched rubons (I think Daisy D?). This was my second acrylic album to finally use my 10th Anniversary trip to San Francisco. Our first time away from the kids (how sad is that???)" 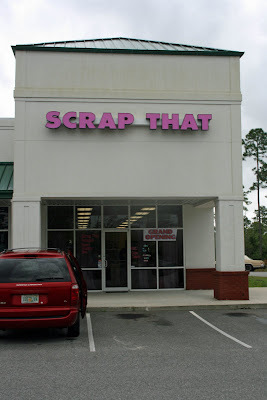 For those scrappers living in and around Pensacola, Scraphappy is celebrating Scrap Pink Sept. 25, 26 and 27. You can find out more details on the store's website. There are lots of ways you can get involved to help raise funds for the Susan G. Komen Foundation, known for its fight against breast cancer: Alter a bra, crop one or all of the three days, take a class, do a make and take, bid in a silent auction... and that's just naming a handful of ways! I will be there each day of the crop, teaching a different class. I am not sure of all of the kit designs, yet, but I will be sure to post them on my blog and on the K2R Calendar! Plus, if you are in the area, they will be on display at Scraphappy, so stay tuned! 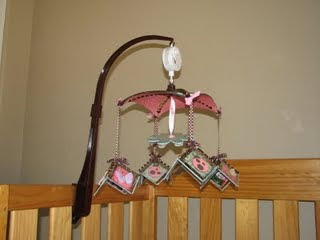 K2R Design Krew member Jenn created this unique project - a baby mobile! Not only does she explain how she created it, but she also has some video check out. If you have seen her post yet, head on over to the K2R Krew blog now! The last week of the K2R Anniversary celebration! Congrats to our recent winners! K2R had a couple dozen Kommenters... thank you all for your kind words! Rachel A. from California, the third Kommenter, was the one chosen by random.org! And the Krew blog commenter is Summer B., from Virginia. Both Rachel and Summer have each won a Kits2Remember stadium album! Rachel, be sure to email me (jessica@ kits2remember.com) with your address! There is one more week of the K2R 2nd Anniversary Celebration! This is the last week to work on your projects for the K2R Anniversary Kontest! All entries are due Friday, August 14, though we've gotten a handful of entries already. The Krew and I are SO looking forward to seeing what you guys have up your sleeves! One lucky - and talented - winner will receive a $250 K2R prize package featuring K2R products and more! There are five different categories you can enter your project in to: Acrylic, Metal, Mixed Media, Kits and Rubber Stamps. And the grand prize winner isn't the only one getting some prizes! One finalist will be chosen from each of the categories and receive a prize package worth $50. Click here for more info about the Kontest! 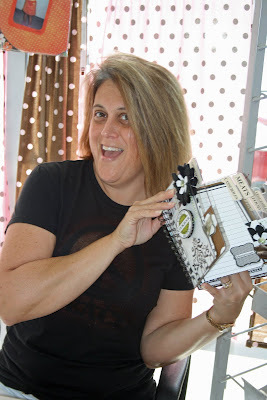 This weekend, The Red Bee, from Tustin, CA, took some Kits2Remember products and kits and had a successful Scrapbook Expo in Santa Clara, Calif. In fact, they had such a great show, they will be doing it again across the country at the Scrapbook Expo in St. Charles, IL. 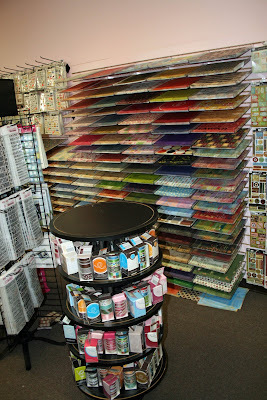 Stop by The Red Bee booth and stock up on acrylic, metal and chipboard. If you're a kit scrapper, they'll have some of those, too! So, be sure to stop by The Red Bee booth if you're a scrapper in the Chicago area. If you are in the Pensacola, FL., area, there are two seats left in my acrylic cookbook class Saturday, Aug. 22 at ScrapHappy. Be sure to contact Christy right away to secure your seat in this popular class! I am pleased to announce that Kits2Remember products and kits will be available at the Santa Clara, Calif., Scrapbook Expo next weekend. Stop by The Red Bee booth and stock up on acrylic, metal and chipboard. If you're a kit scrapper, there are a couple of new ones they will have available for you. We?re looking for a few good scrappers! From now until August 14, we will be accepting emailed entries in to our Kits2Remember Anniversary Kontest. One lucky - and talented - winner will receive a $250 K2R prize package featuring K2R products and more! There are five different categories you can enter your project in to: Acrylic, Metal, Mixed Media, Kits and Rubber Stamps. And the grand prize winner isn?t the only one getting some prizes! One finalist will be chosen from each of the five categories and receive a prize package worth $50. Click here for more info. We?re looking for some Komments! Kits2Remember would love to hear from you! We want some testimonials from real K2R customers who have been inspired by our products, classes and commentary (kommentary?). Comments will attributed to you, with your first name, last initial and home state/country. If you have a comment or two to share, and don?t mind your comment being posted to the Kits2Remember web site, please send them in to: Jessica@ kits2remember.com by August 3, 2009. In the subject line please put: Komments. A random "kommenter" will be chosen to receive an acrylic K2R stadium album and announced by August 7! There is a large selection of scrap stuff there, from papers to embellishments, from a selection of manufacturers: Creative Imaginations, 7Gypsies, My Minds Eye and Bo Bunny, just to name a few. There are lots of different themes represented and prices are reasonable. 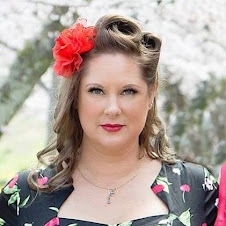 Owner Angela plans to have several teachers from those manufacturers come in to teach in the coming months, so be sure to sign up for her newsletter for notifications. If you are a scrapbooker who likes to see and play with the latest products, you may be disappointed in Scrap That's inventory. Most of the product is about two years old, with some of it being a year old or less. There also doesn't appear to be a lot of crop or class space available. But the store is dangerously close to my home, so I am sure I will be stopping by more often that I should!